Ethereal… that’s my experience of a well-made Pavlova. I fell hard for this dessert when I first had it in Australia. There’s something about the contrast of the pillowy soft sweetness of the meringue against the cool lusciousness of the whipped cream and the sparkle, tang and varied flavors and deliciousness of the fruit. Passionfruit is very common in Australia, but not so much in New York. Whenever I see it here it’s a SIGN that I must make a “Pav” as it’s called down under. Of course, I wanted to be a ballerina. What little girl doesn’t? I took ballet lessons and I had a purple tutu that I loved with sequins and tulle. I’m pretty sure I was not serious about becoming a ballerina, but I was serious about wearing that tutu. I’m very serious about my love for eating Pavlova and spreading the “Pav-LOVE” far and wide. Alas, my tutu days have long since passed and I don’t even have the attention span to watch a ballet. But I can appreciate the beauty, strength and grace of the ballerinas. I imagine that’s what the chef (was it an Aussie or a Kiwi? ), who designed this dessert for the Russian ballet dancer Anna Pavlova had in mind. This dessert is beautiful, melding and taming bold flavors, but ever so gracefully. I think the thing that made me fall in love with Pavlova was the fresh passionfruit squeezed over the top. Passionfruit is plentiful and cheap in Australia, but scarce and expensive here in New York. I rarely make Pavlova, when I can’t find fresh passionfruit, but if you never had it, you won’t miss it. If you have had the dessert with passionfruit you may experience a pang of loss until you bite into the Pavlova. It’s like getting the best massage in your mouth. All your cares and woes just slip away. Don’t skimp on the vanilla in this recipe—use a good one. 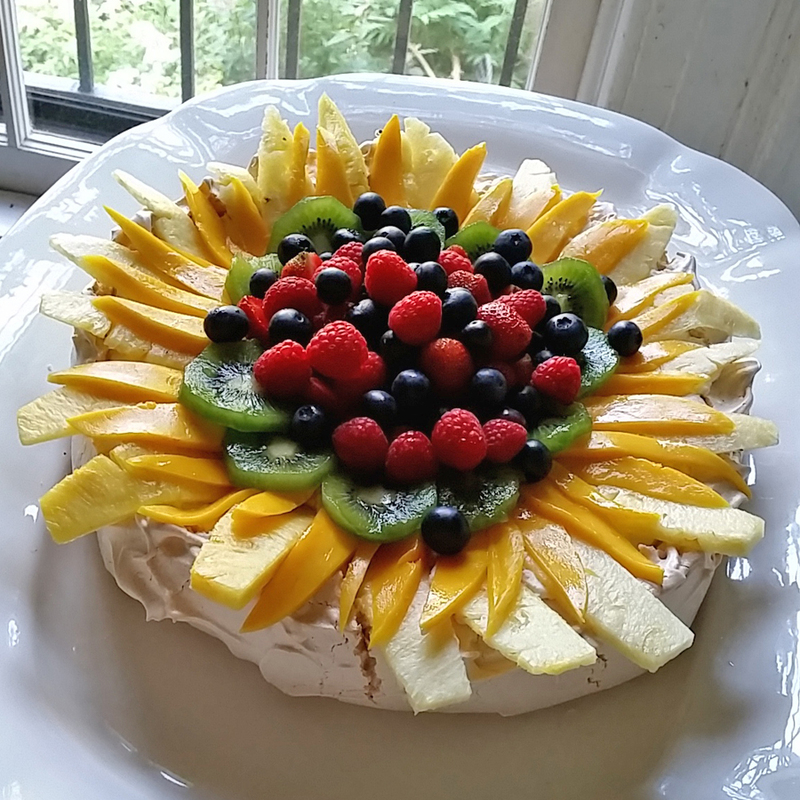 I received a sample of Nielsen Massey’s Vanilla Bean Paste, which I used in this Pavlova. It gave the Pavlova a lovely flavor and speckled it with vanilla beans seeds. But, it also made the meringue a little grey. I might just stick to vanilla extract in the future. If I can get fresh passionfruit, this is my favorite dessert of all time. If not, it has to take second place to a perfect peach pie served warm with vanilla ice cream. Preheat oven to 300F°. Line a sheet pan with parchment paper or waxed paper. Mix together the vanilla and the vinegar in small bowl or ramekin and set it aside. Mix half the sugar with the cornstarch in a small bowl, until there are no cornstarch lumps and set it aside. Beat egg whites on medium speed just until soft peaks begin to form. Beat in the other half of the sugar gradually, about a couple of tablespoons at a time, until the egg whites are shiny and glossy. Beat in the sugar and cornstarch mixture until the meringue is stiff and glossy. Fold in the vanilla-vinegar mixture with a large whisk. Spread meringue mixture on the parchment paper in 8” circle, building up the sides so they are higher than the middle. Bake for 1-1/4 hours. Open the door to the oven and let the meringue dry for a half hour. Cool completely. Carefully place the meringue disc on a platter. Whip cream with sugar, if using, in a medium bowl until soft peaks form and then continue slowly until stiff, being careful not to over-beat it. Spoon whipped cream on top of the meringue evenly. Slice and arrange fresh fruit on top of the cream. If you have it, slice a fresh passion fruit in half and squeeze the pulp all over the other fruit. You can make superfine sugar out of granulated sugar by running it through a food processor fitted with the steel knife. *Personally, I don’t put sugar in the whipped cream because the meringue is already so sweet. **Pretty much any fruit you desire. If you can get fresh passionfruit, do so.